Will You Help Us #StopMomShaming? When you become a mother, one of the things you don't expect is that your parenting decisions will be questioned or judged at every turn. Just ask Chrissy Teigan who can't seem to get a break from mom shamers. We can speak up because we have the power to shut. it. down. Join mom.life today and help create a movement against mom shaming. It’s time to celebrate mom’s right to parent as she chooses. Share your personal shaming story on social, how it made you feel and where you went for support. Share your personal affirmation using our I am a #strongmom printable and I am a #proudmom printable along with the #StopMomShaming hashtag on social media. Don't forget to use the hashtag #StopMomShaming with every social share so we can all work together to spread the movement of positivity. mom.life recently conducted a survey of moms within our app, to get to the heart of mom shaming and how it is affecting the modern mother. The results were disheartening and frustrating to say the least. And, it turns out that 80% of the moms who participated in the survey have been shamed in some way. 70% of those mothers, were shamed by other moms. Also included in our findings? 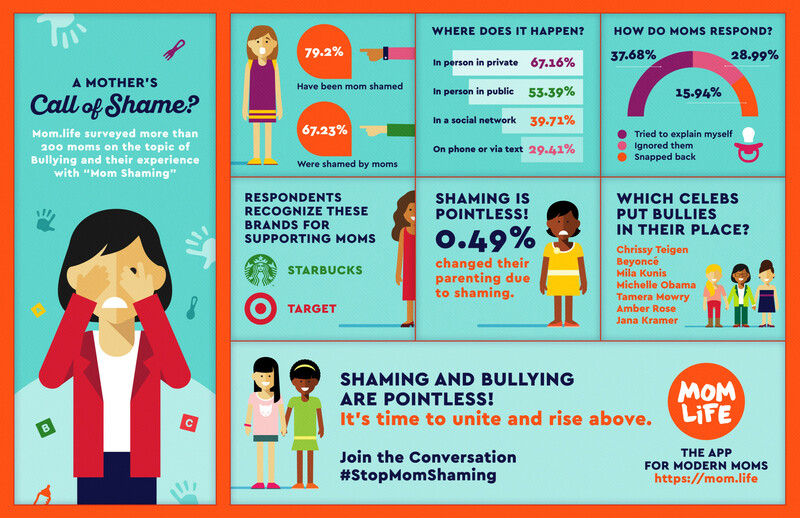 Will you help us create a movement to stop mom shaming? Join us in this conversation using the hashtag #StopMomShaming using one of the options offered above.